↑ Martin, Jacqueline Briggs; Illustrated by Mary Azarian. Snowflake Bentley (Boston: Houghton Mifflin Company. 1998) ISBN 0-395-86162-4. ↑ 7,0 7,1 Moreno, Fred. 'Wilson Bentley: The Man Who Studied Snowflakes', Update (New York: New York Academy of Sciences, June/July/August 2005) pp. 8-9. 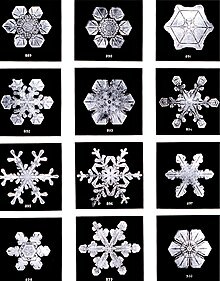 ↑ [JHS] Wilson Snowflake Bentley – Photographer of Snowflakes (Jericho Historical Society, 2004). Retrieved July 26, 2005. Blanchard, Duncan. The Snowflake Man, A Biography of Wilson A. Bentley, " (Blacksburg, VA: McDonald and Woodward, 1998) ISBN 0-939923-71-8. Stoddard, Gloria May. «Snowflake Bentley: Man of Science, Man of God.» (Shelburne, VT: New England Press, 1985) ISBN 0-933050-31-3 (Originally published in 1979 by Concordia Publishing House, ISBN 0-570-03620-8).